The 1980 burning of the Spanish Embassy in Guatemala was an assault by Guatemalan security forces that left 37 dead. After a decades-long search for justice, Pedro García Arredondo was found guilty on January 19, 2015 of orchestrating the massacre. He was sentenced to a total of 90 years in prison. On January 31, 1980, a group of Maya K’iche’ farmers and their allies, protesting assassinations and disappearances in the department of El Quiché, took over the Spanish Embassy in Guatemala City. The occupation involved the taking of a number of hostages and was a last resort. The activists took a series of actions to raise awareness about the repression and violence that indigenous communities were facing, including an attempt to be heard by Congress. All were unsuccessful in getting a reaction from the Guatemalan government. In response to the occupation, security forces encircled the building and began an assault, quickly occupying the first and third floors — despite the ambassador’s warnings that to do so violated international law. The attack ended with the burning of the embassy and the death of the 37 occupiers and their hostages, including several Spanish diplomats. The Spanish Ambassador Máximo Cajal survived along with demonstrator Gregorio Xujá, who was kidnapped from the hospital later that night and tortured. His body was found the next day, dumped on the campus of the University of San Carlos. 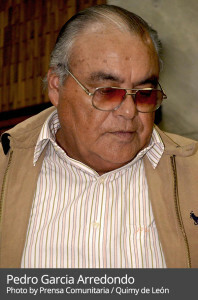 Also among the victims was Vincente Menchú, father of Rigoberta Menchú Tum, who is a complainant in the case and would later be awarded the Nobel Peace Prize. Nearly 35 years passed since the 1980 burning of the embassy. Then, on October 4, 2014, the case moved back into the public eye as the Guatemalan Human Rights Prosecution Unit finally charged Pedro García Arredondo — former Chief of Command Six of the now defunct National Police — with orchestrating the massacre and giving orders to prevent anyone from leaving the embassy as it burned. Two civil parties also joined the lawsuit — The Rigoberta Menchú Tum Foundation (representing the victims), and Sergio Vi, the son of one of the victims. Oral and public debate began in early October, and the case moved forward over the next 4 months. On January 13, 2015, final witnesses were heard and the lawyers for both the prosecution and the defense presented their closing arguments. Prosecutors called for a sentence of 1,240 years, while the defense argued that Arredondo was not responsible for the police attack or the related fire, which it claimed was started from within the embassy. The complainants also took the floor, calling for justice and dignity for the memory of their relatives and all those who lost their lives on January 31, 1980. On January 19, Arredondo gave his testimony before a three-judge tribunal, continuing to proclaim his innocence. Later that day in front of a packed courtroom, Judge María Eugenia Castellanos read the verdict, stating that the tribunal “unanimously declares that the defendant is the perpetrator responsible for the crimes of murder.” During the reading of the verdict, the names of each individual killed in the fire at the Spanish Embassy were also read aloud. Arredondo was sentenced to 40 years in prison for crimes against humanity, homicide and attempted murder. He received an additional 50 years for the murder of 2 students after the massacre occurred — for a total of 90 years in prison. Arredondo was already serving a sentence for his role in the 1981 disappearance of a student leader. As the verdict was read, the crowd that had gathered in the courtroom burst into applause. Outside the courthouse, indigenous community members continued a traditional Mayan ceremony, which they had gathered earlier to hold. The scene outside the courthouse just after the verdict was read.